Question: Is It Okay To Put A Mattress On A Bed Frame Without The Box Spring? This is possibly one of the most understood questions we get asked. While boxsprings and foundations have very different names, they are very similar to one another in what they actually do; they are both designed to be used as the base support that goes directly underneath nearly every kind of mattress that is made. The comfort part of the bed is the mattress sits directly on top of the boxspring or foundation which in comparison is very flexible. This flexibility can come from several different inner workings; coil springs, latex rubber, memory foam or a hybrid of the aforementioned. The malleable core and sleeping surface is designed to easily mold and contour while also supporting the curvatures of a person’s body. Placing it on anything but a supportive surface can cause it to break down prematurely, sag, or worse still fall between the steel supports. When you choose a Hollywood style frame or bed that has steel side rails and a couple steel slats spanning the width you do NOT have enough support to place a mattress directly on the slat system. Even adding additional steel slats is usually not enough support. In order to place a mattress on plank slats, they must be closely spaced. The specific spacing depend will depend on the builds warranty requirements of your mattress, but many high end mattress producers likes to see spacing of the metal braces or wood laths to be no more than 2-3 inches apart. This is significantly closer spacing than typically found on even the best metal bed frames. 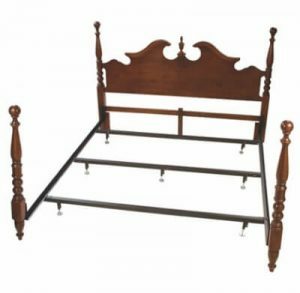 The fact is when you are using a bed frame that is made from steel or metal type and has a length running or width running middle support bracing will necessitate that you use box spring foundation. How can I get away without using a boxspring? It is simple you can sleep on a mattress without a box spring comfortably, but there are a couple of different ways to do it. These days a boxsprings are nothing more than a rigid riser referred to commonly at a foundation or semi flex boxspring, the fact is most do not flex or give, so they really add nothing to the comfort of a mattress. So you can skip it if you want to for an alternative base support like a platform or divan bed. Most such beds are essentially wooden frames with slats. Some are very basic while others are more fashionable. The important thing is to be sure the warranty allows for use of the mattress without a box spring and that you know the manufactures support requirements. The important thing to notice is that all of these systems all have center support bars. While they are all strong and made of angle iron and steel, they all have one, two, and even as many as four slats spanning the bed’s width. These are perfect examples of what a mattress by itself should NOT be placed upon. A closely spaced slat pack with some strategically placed legs in the middle is a possible solution to use in lieu of a box spring or foundation. If you have further questions as to whether your frame will support a mattress, email us pictures showing the frame you are attempting to put your mattress own and we can try to give you our opinion of whether it will work or not. You can also reach out to us at the toll free number at the top of this page. Do I need a box spring mattress for my daybed or do I need both box and mattress? I have a queen size bed that sits on metal tubes. At one tine l-shaped plastic end were inserted in the end of the tubes. Could you please tell me where I might order new ones? I just had a new queen bed and box spring delivered I have it on a normal bed frame it appears to only be about 5 inches off the flooor However the box spring seems about 9 but the mattress pillowtop is allmoxt 12 inches. My feet dont touch the floor.Way to high. Not sure what to do I was reading about Platform bed which reguire no box spring. It seems that is my only option if want to keep this mattress. Or might be able to send it back and just rebuy the matress. I dont see any other options. Is the low profile bed frame directly on the floor? How else would it lower it? Hi Debra, Let me start by saying there really is no such thing as a normal bed frame these days. If there was I would have to say that 7 to 7 1/2 inches off the floor would be the most common size. Your 5″ tall frame is actually lower than what I would call normal by 2″. Platform beds are another option, no boxspring is required. Low profile bed frames are another option. I don’t believe they are going to be much help in this case. Please try our Easy to use Bed Frame Finder Here for assistance or give us a call during regular business ours. I have an old fashioned high four poster queen bed. I only want to lower it for one week during my ninety-one year old father’s visit. It is too high for him to get into with the box spring. My bed currently has four wooden slats but we could add more slats for additional support. I would like to place the mattress directly on the wooden slats. Would this be a safe “temporary” fix? Thank-you! my antique bed frame is 53×74. Can I still use a mattress 54×75 if I put it on top edge of frame or will it fit inside frame?